Margaret Matthews, a long standing and much appreciated resident, is shortly moving to sheltered housing and I thought it would be good to hear some of her memories of living on the Estate. When did you move into Ethelburt Avenue? In 1934, aged 3, with my mother and father. We were the second residents in the house after an elderly lady moved out. Why did your parents choose Ethelburt Avenue? My father admired the work of Herbert Collins and was sympathetic to his ideas about housing and the ‘garden city’. Apparently, the houses on this estate were built for sale to fund the houses built for rent by the Swaythling Housing Society. 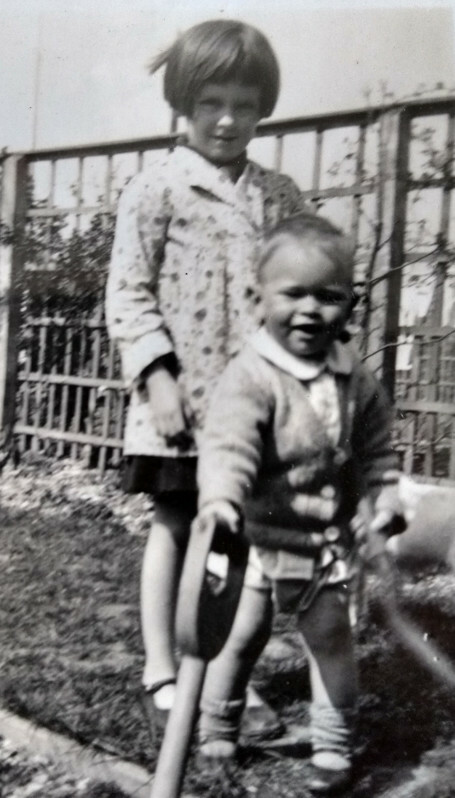 Aged 4, I started at a nursery school in Mrs Foster’s home in Channels Farm Road before going to Bassett Green Primary School. In 1940, during the war, I was evacuated to cottages in Ovington, near Alresford, with families from numbers 91 and 95 Ethelburt Ave plus another family from Field Close. My father worked in Southampton Monday to Friday and joined us at weekends. In September 1941, aged 10, I was sent to a Quaker boarding school in Yorkshire. I was very homesick at first. My mother would take me by train to Waterloo and we’d pray there wasn’t an air raid so we could get across to Kings Cross where I would meet the other pupils and teachers to travel north. What are your early memories of the Avenue? Walking down the road hand in hand with my mother. In the days before fridges, we had to go shopping down in Swaythling every other day. There was a grocer, a butcher, a fishmonger (where we got cods’ heads for the cat), two chemists, a draper, a Post Office and an ironmonger. You could get everything you needed in High Road. There was even the Savoy Cinema along High Road. Also, a greengrocer would come round the Estate in an open lorry and there was a horse drawn milk float. The horse was partial to the bark on the cherry trees. Lowman’s baker would deliver bread and ‘the onion man’ from France came until about 10 years ago to deliver onions by bike. This entry was posted on Thursday, February 7th, 2019 at 7:12 pm and is filed under 2019 Newsletters.You can follow any responses to this entry through the RSS 2.0 feed. Both comments and pings are currently closed.